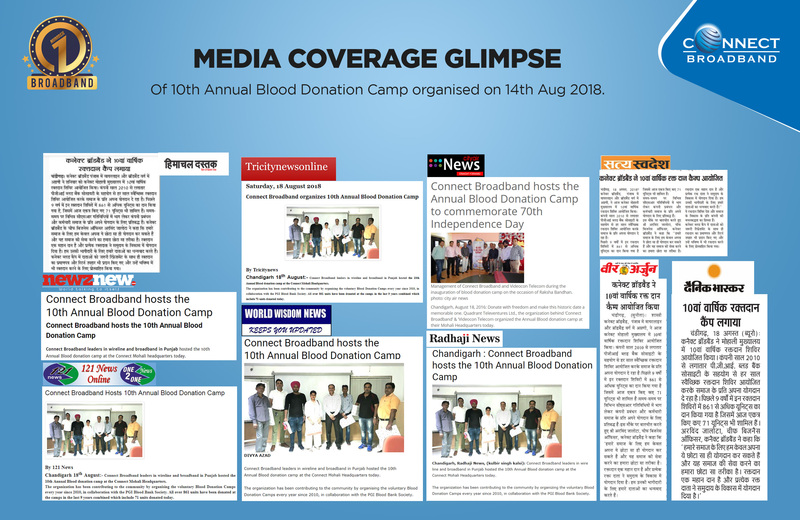 Quadrant Televentures Ltd. Mohali the organization behind the brands Connect Broadband in Punjab has been organizing voluntary Blood Donation Camp since 2010 at their Head Office in Mohali. The camp used to be organized every year on the eve of the Independence Day in collaboration with the PGI Blood Bank Society. All over 861 units have been donated at the camps in the 9 years combined which include 71 units donated today. The Management & Employees of the Company are committed towards contributing to the society by participating in various CSR activities from time to time. They believe that it is very important for all the business houses & organizations to actively participate & contribute towards the welfare & development of the society. This was the 10th Blood Donation Camp in 9 years at Mohali in addition to many Blood Donation Camps organized at zones. These Blood Donation Camps are a part of the Company’s commitment towards development & well being of the Society & the Nation.